Ten years ago this October, running, jumping, bouncing, dancing, singing, loving, smiling, riding three-year-old Finn Sullivan died. Ignited by loss and a touch of happenstance, and fueled by love, Lynn Valley’s most powerful charity was born: Team Finn. Not even two years old, Finn Sullivan had a scary secret – a grapefruit-sized tumor of the rare childhood cancer called rhabdomyosarcoma. His parents Patrick and Samantha were devastated. He endured chemo, radiation, surgery and countless other procedures. But Finn’s energy and push to keep up with older sister Sarah and his twin brother Baird also meant days of play and joy; days on which the only signs of sickness were his grey pallor and catheter bag. He battled and played and battled and played, but tragically the cancer returned in the spring of 2008. Ultimately, three-year-old Finn died that October. Shortly thereafter, a new cancer fundraiser began to make a name for itself. The inaugural 2009 Ride to Conquer Cancer challenged people to raise money by cycling over 200 km from Surrey to Seattle over two days. In its inaugural year, Team Finn included 29 riders – the majority from the North Shore and Lynn Valley. The Sullivan family feel Team Finn is rooted in the forests and hills of Lynn Valley. From its first fundraiser in Year One, put on by the Lynn Valley Parent Participation Preschool, to other years’ spin-a-thons and bake sales. 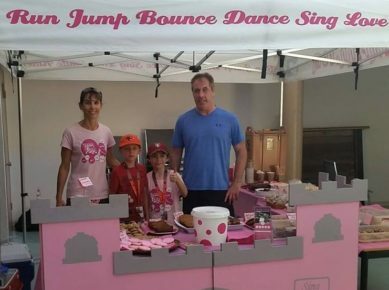 “That grassroots support continues [with] this year the garage sale that Sarah’s Girl Guide Group organized or Ben’s Big Lemonade Stand and Bake Sale [coming up in August, details below]. 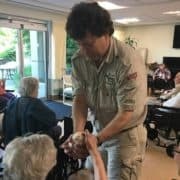 There is a community feel to Team Finn that is similar to the community feel of living in Lynn Valley and that is something that we never want to lose,” said Patrick. Today the team includes friends, researchers, and former strangers who were touched by Finn’s story, now all united to change the story of childhood cancer. That mantra is the foundation of every decision Team Finn makes. “The mantra explains why I continue to ride for the team – it’s about living and helping children live,” said Nicola. “And we welcome everyone in the community; it doesn’t matter if you are an athlete, or what age you are, and whether you look good in lycra or not! 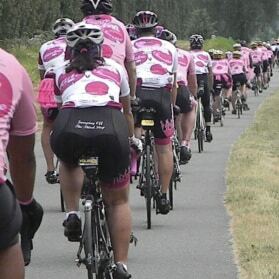 “When I see other pink jerseys out on the road I feel so proud to be part of such an amazing team,” she said. Those jerseys are now synonymous with the RTCC. They have been there from the beginning. The riders have a reputation of joy, big hearts, and encouragement. Most families who suffer a tragedy this devastating do not go on to create a multi-million-dollar foundation while mourning, parenting and working. Soon the Sullivans got to know some of the scientists who were using the money because they too joined Team Finn. It reinforced their goal to be hands on active with both the research and the children undergoing cancer treatment. “The ride money goes primarily to research. This year the money is going to some really promising immunotherapy that we want to bring to B.C.,” said Patrick. 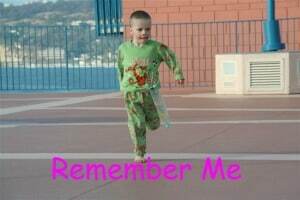 The rare cancer Finn had – rhabdomyosarcoma – attacks only three to four kids each year, said Patrick. And the cure rates really have not changed much in the last 10 years. 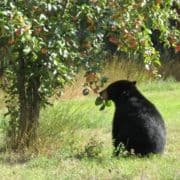 Patrick is noticeably excited when he talks of the work of a team of doctors from across the US and Canada, one of whom is UBC’s Dr. Poul Sorensen – a Team Finn member and international renowned scientist. 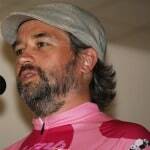 Sorensen focuses on childhood solid tumours. His lab has discovered many novel chromosomal translocation associated genetic alterations in childhood solid tumours. This work has been translated into better diagnostic tools for childhood solid tumours that are used all over the world to accurately diagnose childhood cancers, and to better understand the biology of childhood cancers. Patrick regularly travels throughout North America speaking to researchers and hospitals – in fact he did this interview in a car on his way to Montreal after speaking in Philadelphia. The visit reinforced for him the importance of such travel; the chair of the conference told him not to underestimate the impact he has when he speaks. Team Finn also has the Finnispiration Smile Fund which works with BC Children’s Hospital. The fund in recent years has painted murals, improved radiation masks and purchased virtual reality goggles to distract kids during treatment. 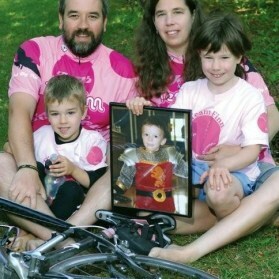 This is a year of anniversaries: 10 Ride to Conquer Cancers and 10 years since Finn died. They have more than 90 riders signed up this year and Team Finn is always welcoming to anyone who can embrace the mantra and live as Finn lived with energy and joy. “More important than anything else we do – the responsibility when you put on that jersey to be positive and encouraging,” said Patrick. August 18, from 1 – 4 p.m. head over to the Big Ben’s Lemonade and Bake Sale at 1960 Rufus Drive. For more details visit its event page. Join or donate to Team Finn’s Ride to Conquer Cancer Team. Click on any one of the riders on the roster to learn about their reasons for riding or to donate. Cheer on the riders you see training in Lynn Valley.